The Dreamworks Trolls movie was a sensation, and it’s no wonder, with its stellar cast of voices. Trolls is about a small village plagued by Bergens, creatures that like to feast on unsuspecting trolls. Poppy, the princess of the village, is just dying to throw a party. But when her enthusiasm and excitement put them all in harm’s way, it’s up to her and her companion Branch to venture out into the great big world and rescue their friends. This story about friendship, individuality, courage, and the need for compromise is sure to warm little hearts all over. Below, we’ve gathered ten of the most popular and successful toys and games modeled after Dreamworks’ hit movie. Let’s get colorful! 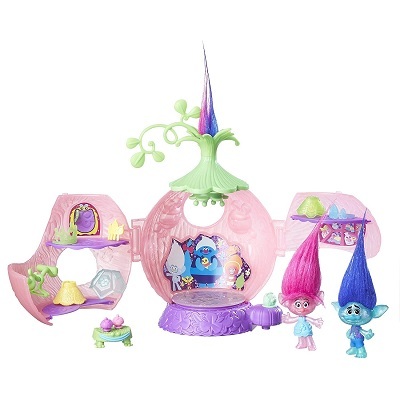 Find your favorite Trolls toys in our brand new, easy-to-read format! This update allows you to compare numerical ratings of each product side by side. The Born Cute research team has recently reviewed the following guide and updated it to reflect the best-selling and most high-quality products on the market. We’ve replaced out of stock items and swapped out pieces that children might find less exciting for true blue toys and games they’re bound to play with for months and years to come. 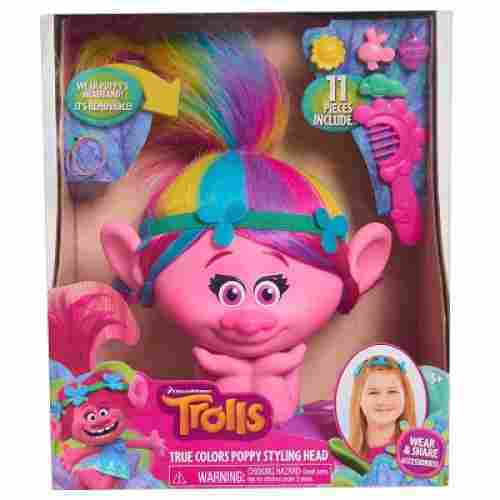 Two new products find their way onto the Top 3 Picks list for best Trolls-related toys. These toys, based on the DreamWorks movie, appeal to both boys and girls. Product availability, pricing and details have been verified and updated. Drawing is a skill and we love that this will get your child’s creative forces going and at work. They’ll learn how to easily trace things which will improve their hand-eye coordination while giving them the confidence they need to create art. Age Range: At least 4 years old. 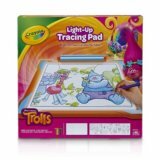 It doesn’t matter whether your child is an avid drawer or just beginning, this Trolls Light-Up Tracing pad is one thing that must be on your list. 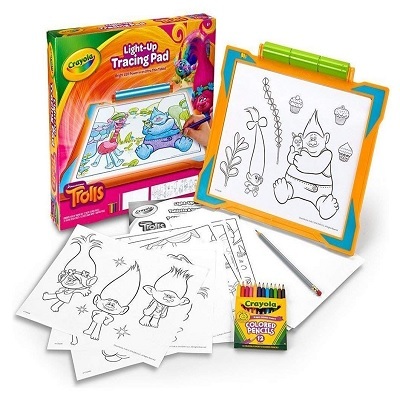 If your child is a lover of the Trolls series and just can’t get enough of it then this drawing pad is the way to their heart. 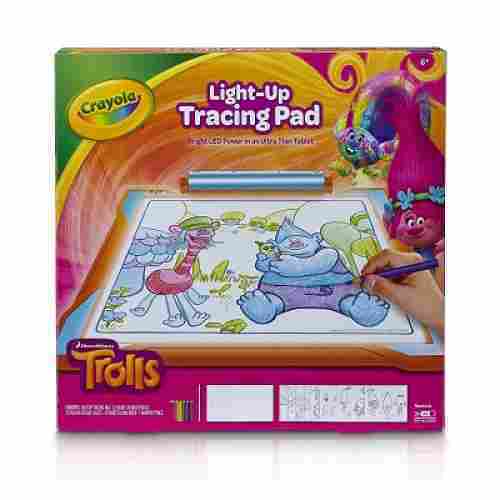 This pad is perfect for the beginner because it features a powerful LED light that gives the background just enough glow to make tracing easier. 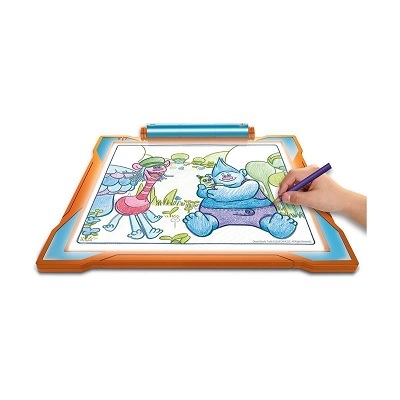 It also locks stencils into place so that your child won’t have any issue with sliding, whether they’re drawing on a table, the floor, or even in the car. This set provides everything your child needs to draw their favorite funky-haired characters, including ten tracing sheets, ten pieces of paper, 12 colored pencils, a tracing pencil, and the tracing pad itself. It’s an awesome gift with even for awesome results! 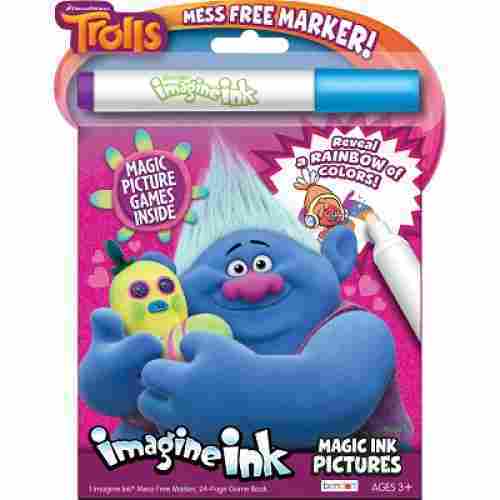 Your kids will learn to draw and do so with all the encouragement they need from their favorite Trolls. This pad makes it easy for beginners to use while also giving more advanced artists the freedom to draw things how they want. Even though this set only comes with Poppy, we like that there’s so much for kids to do with her. 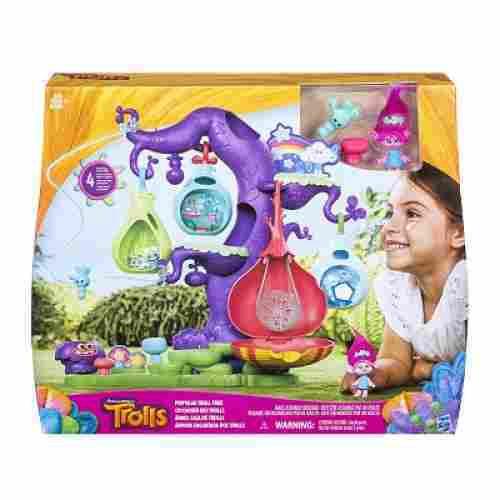 Whether she’s jumping around from tree pod to tree pod or simply just lounging on a mushroom, kids will find endless ways to play with this Trolls set. The Dreamworks POD’ular Troll Tree is a massive toy, at over 16 inches tall, your child won’t even know where to begin playing! 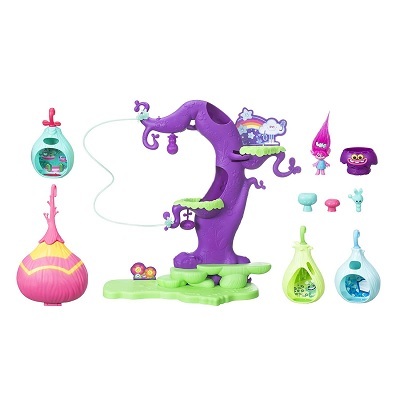 The tree itself serves as one giant home for the tiny Troll that comes with it and will encourage some serious imaginative play for fans of the popular show. Kids will be able to play with tiny Poppy and help her explore every aspect of this mind-blowing tree building that houses several unique pod “rooms” that she can hide in. The sheer size of it will bring a smile to your child’s face when they realize they can have a Trolls wonderland right in their very own living room. Poppy can swing from the tree branches and have a blast sliding down the vines to the bottom, and your child will love coming up with different scenarios for her to take on. Poppy even comes with her own accessories and tiny Trolls pet so she’ll never be alone, it’ll just increase the fun for your little one! 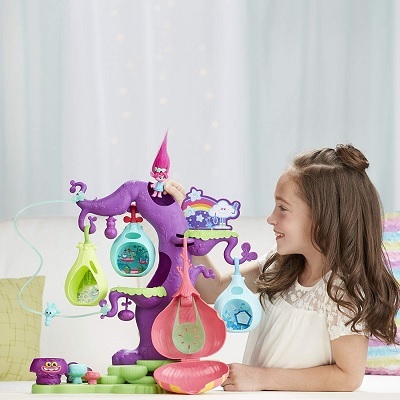 This Trolls pod tree will help encourage kids to use their imaginations, whether they base their play off of the show or what’s in their own creative minds. The size of the set encourages them to get up and physically move around, which makes it both mentally and physically stimulating. It’s a pocket sized little slice of color and fun for your child. 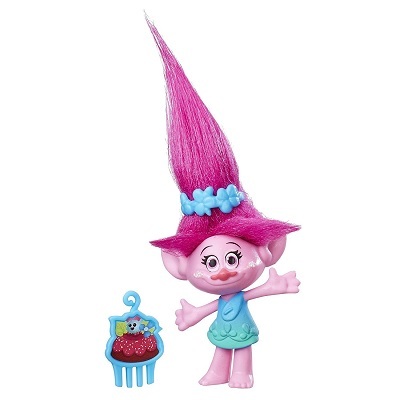 If they’re a Trolls fan, they’ll love how very little this Poppy doll is--just like the movie! She’s cute and colorful and kids are all smiles when they have their favorite characters and dolls along for the adventure. This little Poppy doll is the perfect manifestation of Shakespeare’s “though she be but little, she is fierce.” Sometimes big things come in little packages, and this is just the case with the Poppy Collectible Figure. Sure, she’s only four inches tall (and roughly two of those inches are her hair), but she packs a whole lot of love and fun into each moment spent with her. 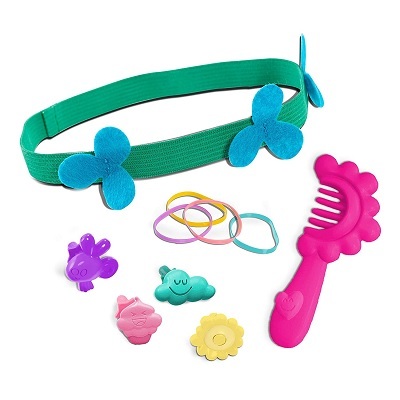 This set includes a miniature comb and headband so your child can help Poppy style her hair. Small enough to fit in your pocket, she’s ready to go on all kinds of adventure. Collect her other friends to play out all of the movie’s best scenes, and discover new journeys besides. This figurine is a great travel companion given her small size; she can fit into jacket zippers, backpack pouches, purses, and more. Role playing games help children establish greater senses of empathy, further develop their understanding of social dynamics, express themselves, and expand their creativity. Figurines and dolls are a great aid in this developmental playground, and Poppy is just perfect for inspiring lots of bright and fun adventures. They’ll fit in the Pod’ular Tree, so if you’re looking for compatible accessories, this is a great start. And it’s nice to have all the major characters represented in one set rather than having to purchase them all separately. Age Range: 3 to 15 years. 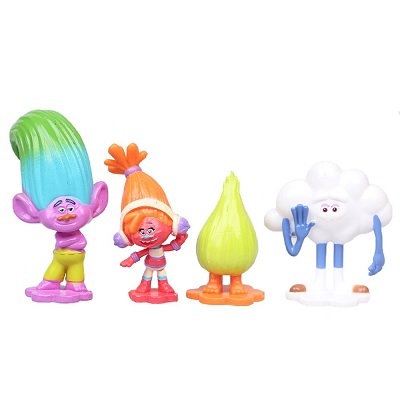 The gang’s all here in this cute thirteen piece Trolls Action Figure Set. Each figurine is painted in vibrant, eye-catching colors with careful detail to resemble their movie counterpart. 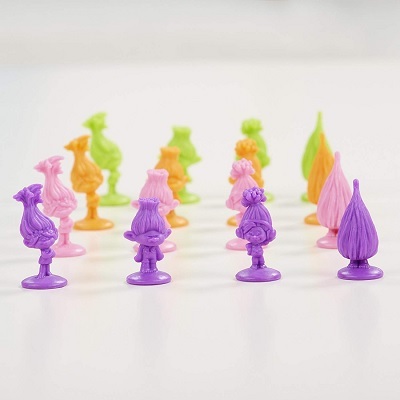 They’re the perfect size for cake toppers, car decorations, or a fun set to add to your child’s collection. They’re small enough to store and travel easily, but that means toddlers may want to gnaw their cute little heads off, so keep an eye on young ones. The set is suggested for ages four and up, and is made of a hard, durable plastic and measure under three inches each. Plus, the set is so large, sharing and playing with friends is a fun and easy task! Engage your child’s imagination and equip them with all their favorite Trolls friends as they embark on creative journeys together. This set is sized well to work with the Pod’ular tree, so combine your sets and enjoy for even more fun! Children will love reenacting the movie and coming up with new adventures of their own, all starring their favorite Trolls characters. Imaginative play is important for children who are still developing their ability to empathize and express. The size of the Poppy Talkin’ alone is already commendable. Add the plushness and the taking feature and you’ve got for yourself a great gift for any kid. 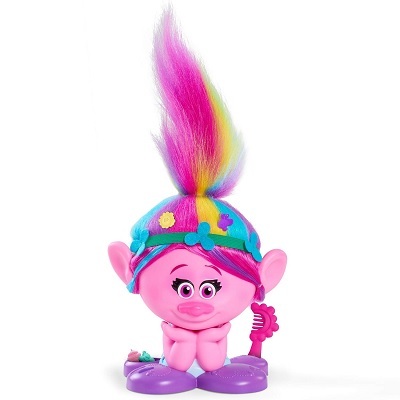 Want a troll doll that is bigger, plusher, and has the unique ability to talk? 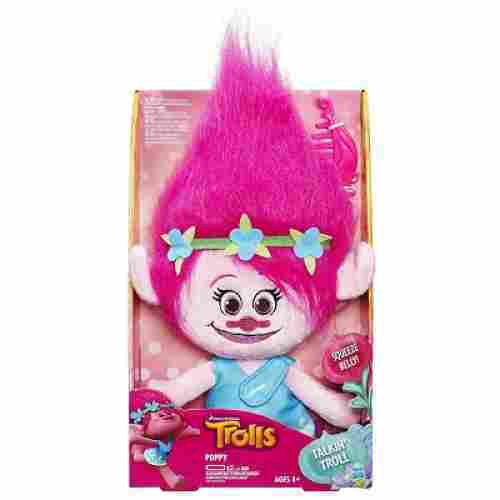 We suggest getting the Poppy Talkin’ Troll Plush Doll. This is the largest in our list at a whopping 14 inches which should make it very ideal for roleplaying activities especially in terms of styling Princess Poppy’s hair with the accompanying comb. Princess Poppy also talks as well as elicits a variety of cool sound effects. Since it’s plush, it can serve as a great cuddle toy to snooze with. 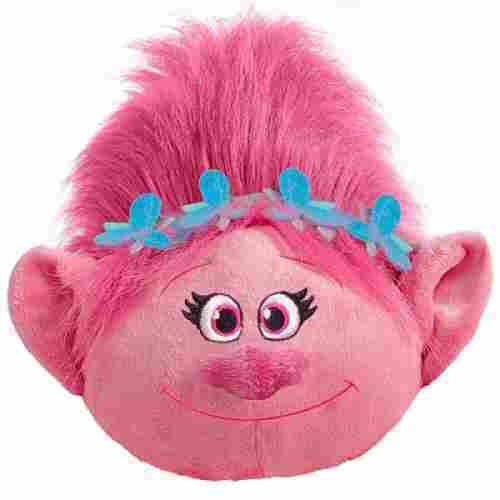 Be the envy of all your friends and family with this 14” plush Princess Poppy Talkin’ Troll! Take Princess Poppy with you to sleep overs or tea parties. Style her hair to that perfect ‘do for any occasion. 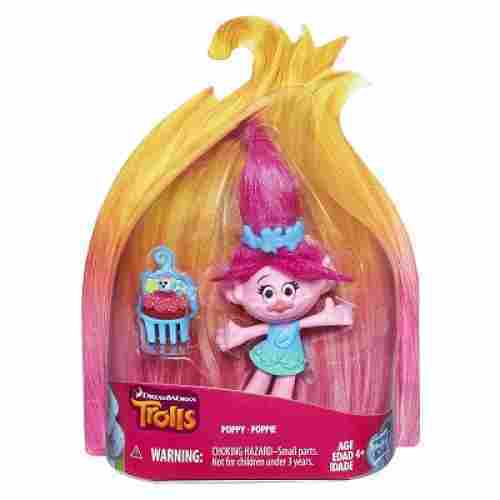 Enjoy bedtime with this Troll sized Princess Poppy Talkin’ Troll Plush to share bedtime stories with. Celebrate in full Troll style with Poppy’s Coronation Pod! Interactive lights and movement. Several party outfits and accessories to always keep the party going! Have your Trolls sing and dance to all your favorite Disney Trolls songs! Relive all your favorite scenes or create your own shows! 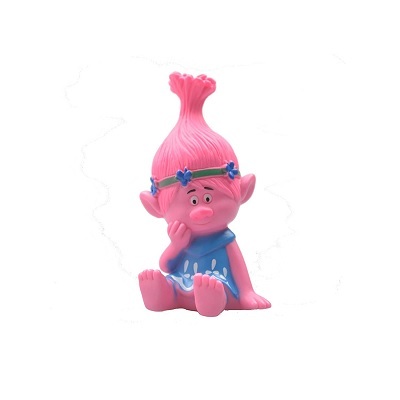 Play dress up or hairdresser with Trolls styled hair. 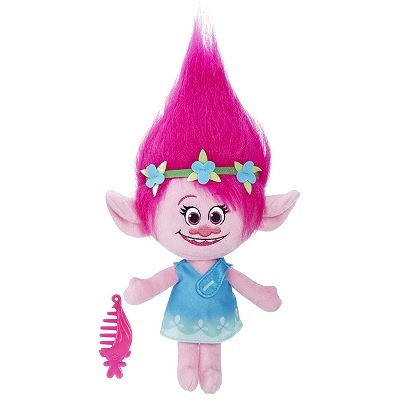 There is even accessories for your Trolls hair. Age Range: At least 4 years old. The Poppy’s Coronation Pod toy Trolls is one fantastic tool for encouraging positivity in the life of your kids. The lights up and mechanical actions as well as the ability to create a fashion style that is unique to these characters are simply amazing. When King Preppy led his happy Trolls to escape from being eaten by the Bergens, he knew that there will come a time when they will have to face their nightmares again. Twenty years has passed and his daughter Princess Poppy is all about ready to inherit the throne in a fitting ceremony that celebrates their escape from the Bergens. And while Branch kept on reminding them of the threat of the Bergens especially with the loud music coming from the festivities, there simply is no dampening the optimism of Princess Poppy. 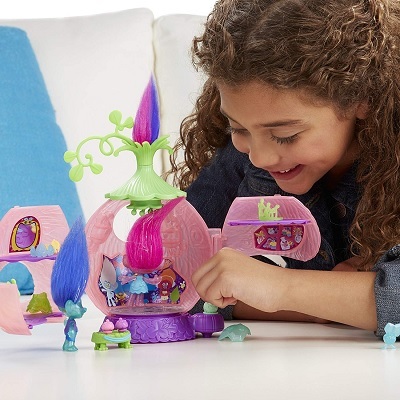 Relive the moments of Princess Poppy’s coronation with the Poppy’s Coronation Pod. 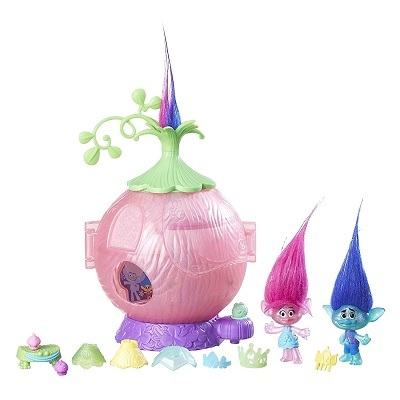 This lovely piece of onion shaped pod that opens to reveal a fantastic stage befitting a princess should bring the magical world of the DreamWorks Trolls right to your child’s heart. The dance floor spins and lights up while playing a song that can surely uplift anyone’s spirits.The positivity of Princess Poppy will fill the room of your child, filling her heart with the joys of the most wondrous song. The Poppy’s Coronation Pod comes with both the princess and Branch. Your child can do her own magic to style their hair as well as put a lot of pizazz to their fashion. With these two lovable characters, we’re pretty confident your kid will have a fun time recreating a lot of storylines that are filled with optimism. It’s just one marker to take, instead of a whole box full, and that marker activates multiple colors in the book, and won’t stain other items. It’s easy to travel with, and mess/hassle-free. Age Range: At least 3 years old. It lets children who are still learning to color inside the lines create lovely, mess-free artwork. The games and activities inside help boost skills such as memory, matching, and problem-solving as well. Children love to color. And parents often love to hang their artwork up on the fridge. But the artistic process is messy for adults and children alike, and before you know it, their studio (or art table) is a tornado of crayons, markers, paints, and various chunks of multi-colored who-knows-what jammed into or leaking onto the carpet and staining the furniture. Give your children the ability to color and create with this mess-free, hassle-free Imagine Ink coloring book. 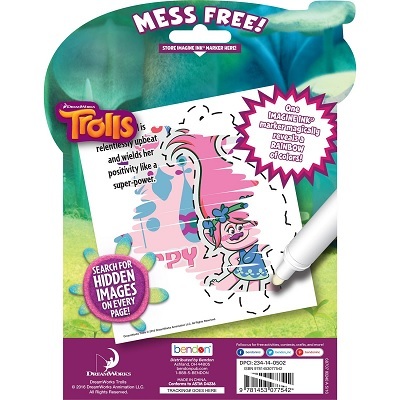 It features everyone’s favorite Trolls characters in twenty four pages of games and activities brought to life by a mess-free magic rainbow ink marker. What an easy and fun way to spend time with your loved ones that uses some strategy and some luck! Never worry about losing your game dice again. This game has the dice you need to play secured in a lovely bubble. Learn about taking turns, sharing, and the best way to get your Trolls home! Age Range: At least 5 years old. 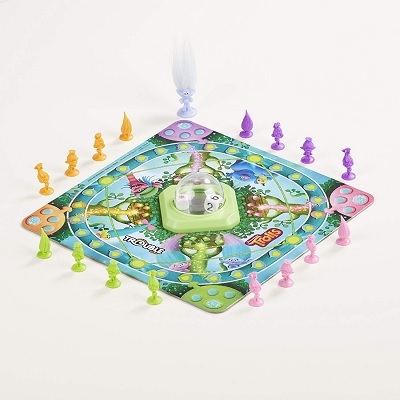 If you want to buy trolls toys for your kids but something that everyone else in the family can also enjoy, then you need to get the Trouble Game. 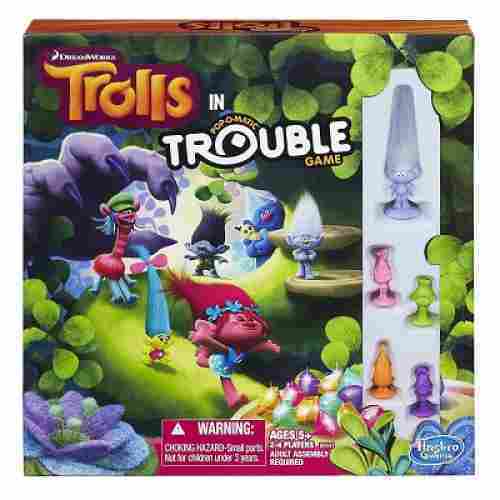 The DreamWorks Trolls in Trouble Game is Hasbro’s take on the classic Trouble Game by utilizing the lovable happy characters from the DreamWorks film. The goal of this fun board game is quite simple: aid our tiny happy beings find their way home across the different obstacles on the game board. But there’s a catch. You’d have to really watch out for the Bergens as they can pop out anytime and take your troll pawns to feast on. Whoever gets all four of his or her troll pawns home safe and sound wins. There are two dices to play with: one for the regular movement across the game and another for some power actions. If you get a Bergen, you lose a turn. Get the Guy Diamond and you’re saved as this is a very powerful Bergen repellant. Get the Hug Time and you get the chance to trade spaces with a fellow player. Just a tip. The fastest and safest way to get home is through the zipline. The dies are conveniently stored in a Pop-o-Matic bubble, a piece of transparent dome that’s smacked right in the middle of the game board. All kids need to do is press the Pop-o-Matic and the dies roll. There will be no misplacing these dies as they stay confined in the bubble itself. 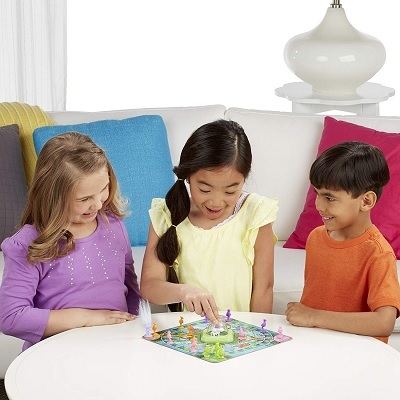 A great colorful and fun board game you can play with friends or family wherever you may go! There’s no better way to enjoy your favorite troll characters than in this redesigned classic game. It’s great for enhancing social relationships as it can get everyone in the family a lot closer. Little ones love playing salon. Poppy’s hair is colorful and easy to style, plus she comes with multiple accessories that she and your child can swap out and share! If they’re going to be “experimenting”, it’s probably best they do it on a doll’s hair instead of their own, at least until they’ve got the hang of it. What are most Trolls notoriously known for (besides their small stature)? That’s right--their hair! Troll hair has been something of an iconic cultural staple since Thomas Dam’s original line. Poppy’s hair is no exception to this, and let us tell you--it takes a village to style a good head of hair! Your little one can help with the Poppy Style Station. Nine adorable barrettes and a mini comb are fit for poppy or your child to use and share. The base of Poppy’s bust also acts as a storage compartment, so all of her toys and accessories can be kept together even when they’re not in play. 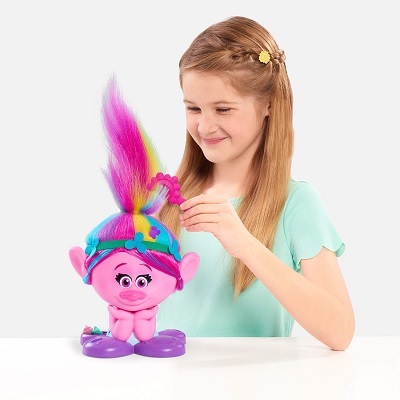 Give Poppy’s rainbow ‘do a new makeover--pigtails, braids, a half-ponytail. Or leave it coiffed in its signature top-knot and decorate it with the wear-and-share hair accessories. Poppy’s hair is soft and easy to style so little ones can get creative while they work. Suitable for ages three and up, this styling station provides hours of fun for busy little hands and imaginative little hearts. This styling station is great for young children who enjoy role-playing. It will help build finger dexterity and strength, as well as working creative muscles and instilling confidence in little ones. They’ll love the colorful hair and accessories, all meant to inspire them to indulge their imaginations. Pillow pets allow children to bring a little bit of comfort with them wherever they go. 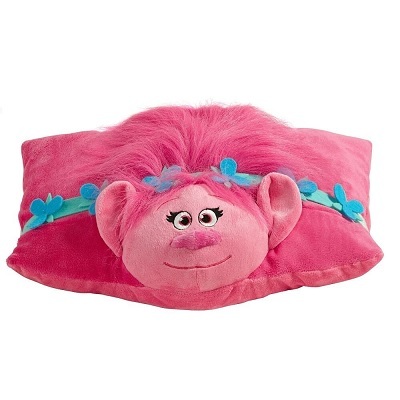 There aren’t many things more comfortable than a child’s favorite pillow, and now they can bring their favorite Troll with them, too! Every kid loves pillow pets. They’re soft, unbelievably cuddly, and can be velcroed in place to be either a pillow or a pet! These Trolls pillow pets have realistic, troll-like hair and the same facial features as their television personalities, which makes them super-realistic for kids. They’re great for long car rides, going to bed, or even bringing to a sleepover. Kids will love the fact that they can squash their pillow, lay on it, or even play with it without having to worry about anything bad happening. When it’s time to wash the pillows, simply throw the Trolls into a white pillowcase, tie off the ends, and wash in the washing machine like normal. Dreamworks has worked with Pillow Pets to create three different and unique Trolls pillows that resemble your child’s favorite quirky characters, and now they can take them wherever they go. The detail that’s in these pillow pets is surprisingly close to what kids are familiar with, which makes them perfect in any child’s room. Whether their permanent place is on the bed, on a bench, or on a chair, you can be sure that your child will love the look and feel of these pillow pets. 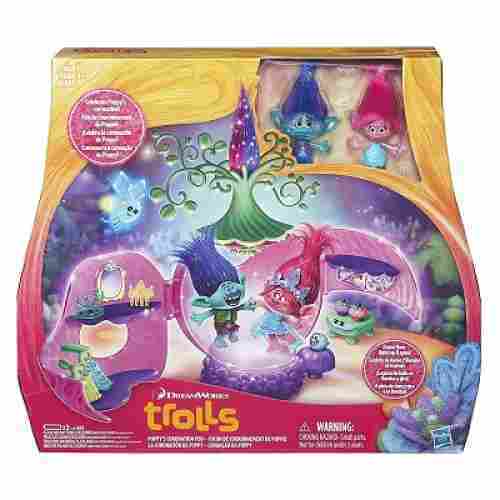 We worked hard to choose the best Trolls toys that kids of any age will enjoy! Children are always looking for the newest, creative, and innovative greatest toy for their birthday or holiday gifts. Kids today expect high-quality, durable, and interactive toys to keep their imaginations at full speed! Providing toys that educate and stimulate your children to contribute to our society as a whole. We can provide a way for them to express themselves in a safe, creative, and non-gender-stereotype environment. Children in this modern age are no longer restricted to just playing with toys intended for “girls” or “boys.” The youth of today is well aware of gender stereotypes, unlike the generations in the past. Girls are no longer prevented from playing with “boys only” toys. Boys are no longer prevented from playing with “girls only toys.” This generation is not afraid of technology. This new demand is pushing the creativity and imagination of toy makers in the industry. Research has shown technology and non-gender-specific toys are the new standard in our society. 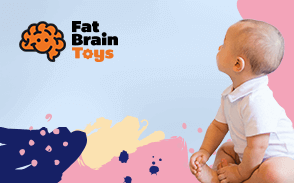 Games and toys that use all parts of the brain are now available. Stimulating our imaginations and using technology through these toys can benefit our society, allowing young minds to grow and adapt in a positive and creative way. Toys that require sharing and taking turns to improve not just children on an individual level, but our society as a whole. Our job is to assist parents in choosing the best toys to assist in the education and entertainment of their child to prepare them for skills they may need later in adulthood. There is a variety of toys on this list to choose from to help you get that perfect gift for your child! The Troll toys on this list are perfect your favorite fashionista, audiophile, hairstylist, event coordinator, skater, and much more! You are only limited by your imagination! When we talk about dolls, it is inadvertent that we only think of it as a toy especially for girls. But the fact is, even boys can benefit from playing with toy dolls. And, in case you’re wondering what it is that playing with dolls can provide to our kids, here are some of the reasons why kids should play with dolls. It helps refine their motor skills especially when performing grooming activities on their dolls such as combing or styling the hair. These require the absolute control of the muscles of the hand which can lead to enhanced motor coordination. It also improves the cognitive skills of children especially in the creation of roles to play. While these may not be readily apparent, they do form the basis of scientific problem solving skills later in life. Playing with dolls helps enhance language development by using the different words and phrases that they can think of to give life to their role play. And it introduces them to the idea of nurturing and caring. For kids, dolls are like their own babies which they must learn to care for. It was never easy choosing the best Troll dolls to be included in a particular list like this. This is perhaps because dolls are inherently a matter of personal preference. For instance, there are children who prefer a Barbie over a Bratz doll while some would rather pick an American Girl doll over any other types of toys. The point is that we have to think as DreamWorks Trolls fans ourselves so we can be effective in coming up with this list. It would simply be a shame if we included something that will not be loved by kids. And speaking of kids, it was imperative that the developmental appropriateness of these products were ensured. We wouldn’t want children to simply be playing with these. We also want them to learn something and, hopefully, come out better children in the process. To support our initial evaluation of these products’ ability to aid children in their growth and development, we had to read the experiences of moms and dads everywhere especially about their kids’ experiences with these playthings. We wanted to identify any similarities in their observations with our assessment. We know this is a very unscientific way of establishing relationships between variables but we were confident that it is the closest thing we can do to make for a more credible product evaluation. q: What size are these Trolls Figures? Depending on the toy, these figures start at 2.5 inches to 9 inches for the plush. q: What kind of hair do the Trolls figures have? 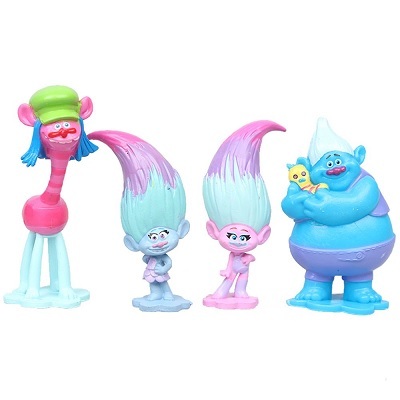 q: How durable are these Troll figures? 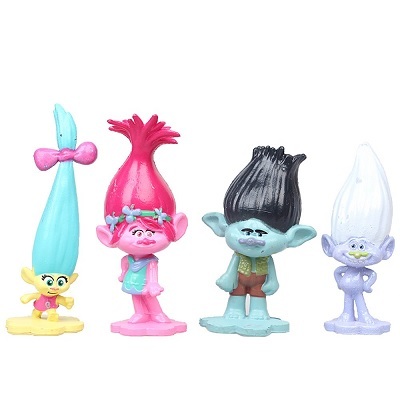 These Troll figures are made out of durable plastic and can be used in the bath or pool. q: What makes these the best Trolls toys? These items are officially licensed and look exactly like your favorite characters. They were chosen for their creativity, durability, entertainment, and to power your imagination. q: Will my child be interested in these dolls if I have boy children? Yes! Of course. If your child has a good imagination, which most do, he or she will love playing with these dolls. They are very funny looking to children and many families seem to love the hairstyle of these dolls. Just because it is a doll does not mean it is geared for a specific gender.